NFL (National Fertilizers Limited) is an organization under Mini-Ratna, premier profit-making Central Public Sector Undertaking company. 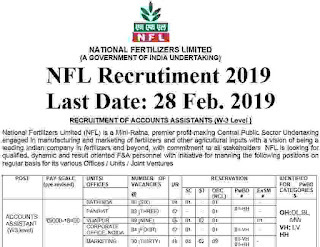 NFL is involved in production and marketing of fertilizers and other agricultural inputs with a vision of being a leading Indian company in fertilizers and beyond, with commitment to all stakeholders. NFL Recruitment department is looking to fill up the vacant positions of Accountant Assistant and Marketing Officers. For filling up these vacant job profile NFL department issued an official Advertisement in which they explained all the criteria and conditions related to these Government jobs for Accountant and Marketing Officers. There are total 52 vacant positions for these job profiles which are going to be filled up after this NFL Recruitment process 2019. NFL is looking for capable, well qualified, active and result oriented candidates for the following positions on regular basis for its various Offices / Units / Joint Ventures. More information related to these NFL Vacancies 2019 is given below in this Job posting. So read it carefully before applying online for these Government jobs for Accountant and Marketing officers. 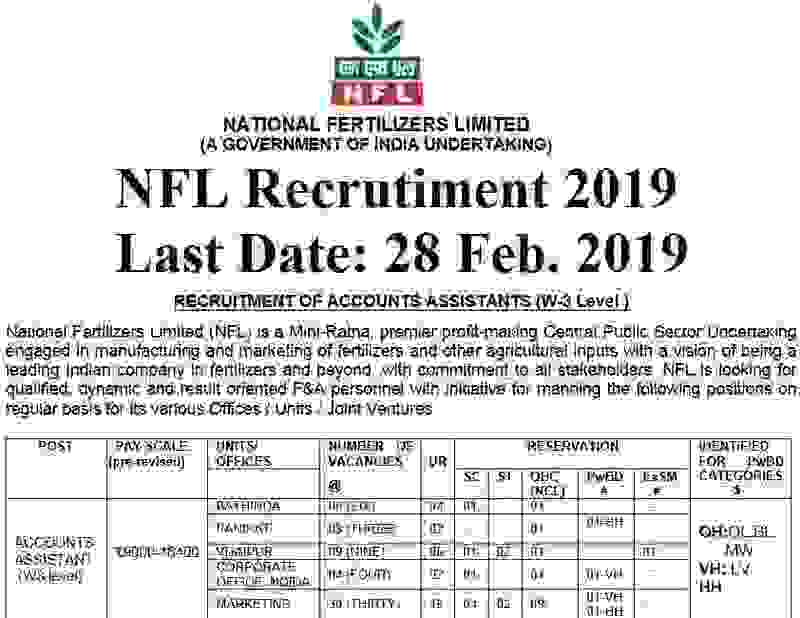 We are sharing the basic information such as job profiles, vacancies and pay band related to this NFL Recruitment 2019 for Accountant Assistant posts. Pay Band for Both Job Profile: Rs.9000 -Rs.16,400 per Month. Educational Criteria: All Indian candidates who have passed in their B.Com Graduation classes with 50% marks at least those who belongs to General/OBC category can apply for these job profiles. Those who belongs to the SC/ST/PWBD category must score 45% marks in their B.Com qualification for applying this NFL Recruitment 2019. Those who lies in between these age limits can apply for these Govt jobs for Accountant Assistant. Aspirants who fulfilled overhead criteria circumstances which we clarified above and now wish to apply one of the above occupation have to pay the application fee according to the category they belongs from. In the table below we clarified the different application fee structure which applicants have to pay according to the category they belongs from. Have to pay the application Fee through one of the following channel: “Debit Card, Credit Card, Net Banking ”.